By default after you install PrestaShop your Store’s home page will be automatically created. This includes the information displayed in the header, footer and content area along with all of the blocks you are able to see there. In this tutorial we will show you how to easily modify that content only for the home page of your Store based on your needs and personal likes. Note that this tutorial will not cover how to edit the header, footer and blocks on your page but only the content presented on your home page. In order to modify the text and contents displayed at the central area of your home page under the Featured Products block you will need to simple activate an additional module. For this reason you will need to login into your Store’s admin backend and navigate to Modules > Modules. Once you are located at the Modules’ home page you can either type the concrete module’s name in the Search box or you can find the module in the Front Office Modules Category. Once you locate the module you should simply click on the Configure Link bellow the module description and you will be redirected to the interface for editing the content of the Home page. If the module is not installed simply click on the Install button next to the module once you find it. As you will probably notice there is a content already loaded on that page. This content is provided with the default installation of your Store and it is only with example purposes. Thus you can easily change that content by changing the values of the fields displayed in this interface. Main Title – The tittle of the content that will be displayed. This title will be displayed in h1 tag as usual. 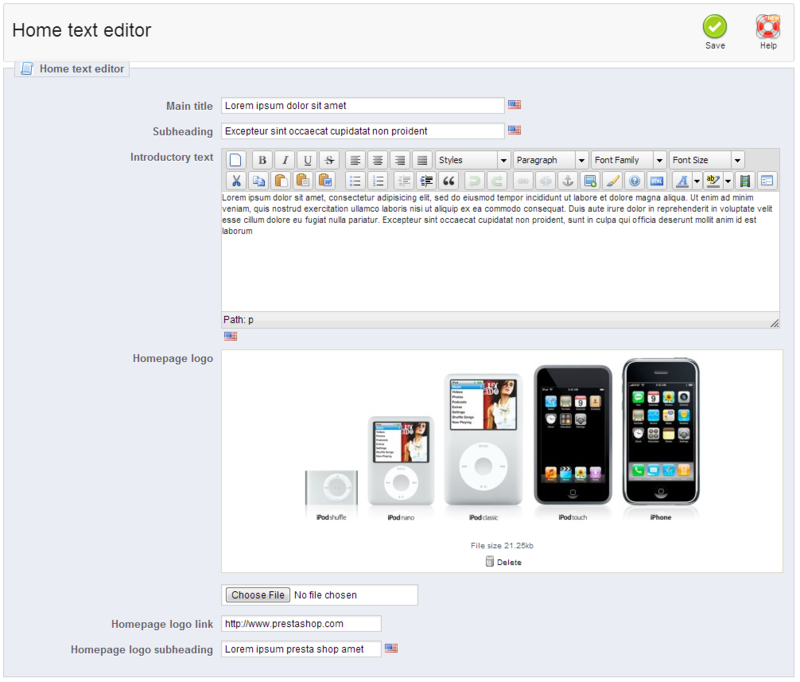 Subheading – The subtitle of the content that will be displayed. Introductory text – The actual text that will be displayed on the home page. Homepage logo – The image displayed above the text on your homepage. Homepage logo link – The link which this image will be using when it is clicked. 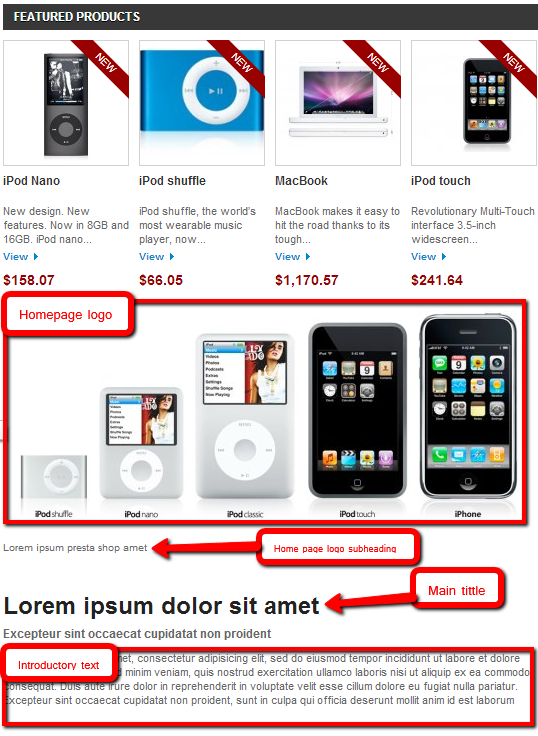 Homepage logo subheading – the subtitle under the uploaded image. Congratulations! You have successfully changed the content of your Home page!